Conservatory Awnings were originally designed in Europe for glass conservatories. 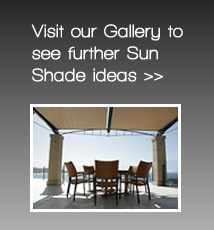 As well as glass conservatories they are also commonly used for shade over pergolas and can also be fitted with posts. Designed for commercial and residential projects, conservatory awnings can be used in a wide variety of applications for protection from the sun. All of our conservatory awnings are engineered to withstand up to Beaufort Category 5 winds (48 km/hr). An extensive range of fabric colours are available. Solution dyed acrylic is the most commonly used fabric for these awnings but various mesh fabrics such as Soltis can also be used. The conservatory awning system runs on tracks and the fabric retracts onto a roller tube into a cassette. The powder coated aluminium cassette protects the fabric when it is retracted. The tracks and cassette can be powder coated any Dulux powder coat colour. They are normally motorised with remote control. The drive mechanism is attached to tapes that run inside the tracks. The tapes run out to the end of the track and around a pulley and back to the front bar that is attached to the front edge of the fabric. The fabric is kept under tension as the front bar is pulled out by the tapes. Ozsun offers three conservatory awning models. The Variscreen from Helioscreen is our premium conservatory awning. The Variopergola also from Helioscreen is the same as the Varioscreen with the addition of posts so that it becomes a retractable pergola with the cassette mounted on the wall and the tracks supported at the far end on posts. The Roma is a budget priced Italian made awning that is offered in a standard white powder coat.